A significant advantage of a bolted joint over other joint types, such as welded and riveted joints, is that they are capable of being dismantled. This feature however, can cause problems if it unintentionally occurs as a result of operational conditions. Such unintentional loosening, frequently called vibrational loosening in much of the published literature, is an important phenomenon and is widely mis-understood by Engineers. It is important for the Designer to be aware of the bolt loosening mechanisms which can operate in order to design reliable joints. The information presented below is key information for the Designer on the theory of vibration loosening of threaded fasteners and how such loosening can be prevented. Study of most Engineering magazines will reveal the multitude of proprietary locking mechanisms available for fasteners. For the Designer without the theoretical knowledge of why fasteners self loosen, this represents a bewildering choice. Presented below is key information, for the Designer, on why fasteners self loosen, and, how it can be prevented. It is widely believed that vibration causes bolt loosening. By far the most frequent cause of loosening is side sliding of the nut or bolt head relative to the joint, resulting in relative motion occurring in the threads. If this does not occur, then the bolts will not loosen, even if the joint is subjected to severe vibration. By a detailed analysis of the joint it is possible to determine the clamp force required to be provided by the bolts to prevent joint slip. Often fatigue failure is a result of the bolt self-loosening which reduces the clamp force acting on the joint. Joint slip then occurs which leads the the bolt being subjected to bending loads and subsequently failing by fatigue. Pre-loaded bolts (or nuts) rotate loose, as soon as relative motion between the male and female threads takes place. This motion cancels the friction grip and originates an off torque which is proportional to the thread pitch and to the preload. The off torque rotates the screw loose, if the friction under the nut or bolt head bearing surface is overcome, by this torque. 1. Bending of parts which results in forces being induced at the friction surface. If slip occurs, the head and threads will slip which can lead to loosening. 2. Differential thermal effects caused as a result of either differences in temperature or differences in clamped materials. 3. Applied forces on the joint can lead to shifting of the joint surfaces leading to bolt loosening. Work completed during the 1960's in Germany indicated that transversely applied alternating forces generate the most severe conditions for self loosening. The result of these studies led to the design of a testing machine which allowed quantitative information to be obtained on the locking performance of self locking fasteners. Such machines, often called Junkers machines (a video of such a machine can be seen - see the bottom of this article) in the literature - after it's inventor, have been used over the last twenty years by the major automotive and aerospace manufacturers to assess the performance of proprietary self locking fasteners. As a result, a rationalisation of the variety of locking devices used by such major companies has occurred. For example, conventional spring lock washers are no longer specified, because it has been shown that they actually aid self loosening rather than prevent it. There are a multitude of thread locking devices available. Through the efforts of the American National Standards Subcommittee B18:20 on locking fasteners, three basic locking fastener categories have been established. They are: free spinning, friction locking, and chemical locking. The free spinning type are plain bolts with a circumferential row of teeth under the washer head. These are ramped, allowing the bolt to rotate in the clamping direction, but lock into the bearing surface when rotated in the loosening direction. The "Whizlock" is in this category. Friction locking categories can be sub-divided into two groupings, metallic and non-metallic. The metallic friction locking fastener usually has a distorted thread which provides a prevailing torque; an example of this category is the "Philidas" nut. Non-metallic friction locking devices have plastic inserts which provides a thread locking function; an example being the "Nyloc" nut. The chemical locking category are adhesives which fill the gaps between the male and female threads and bond them together; "Loctite" is an example. Such adhesives are now available in micro-encapsulated form and can be pre-applied to the thread. To identify which category is the most suitable for an application, requires a careful consideration of the application. In brief, the chemical locking category provides the greatest resistance to vibration loosening, followed by the free spinning locking fastener. However each category has dis-advantages as well as advantages, the most suitable method being dependent upon the application. 1. There is sufficient clamp force present on the joint interface to prevent relative motion between the bolt head or nut and the joint. 2. The joint is designed to allow for the effects of embedding and stress relaxation. 3. Proven thread locking devices are specified. Specifically, thread locking compounds - such as "Loctite", flanged fasteners such as "Whizlok" or torque prevailing fasteners such as "Nyloc". In general, loose washers, of the plain or spring variety, are not generally advisable. The self loosening of fasteners is just one aspect of bolted joint design the Designer must consider during the design process. As can be seen in the photo at the side, even if threads are completely locked together by adhesive, problems cannot be prevented if the bolt preload is insufficient to prevent joint movement. The photo shows a M12 bolt that has been partially worn away by movement. Applying state of the art analytical analysis to prevent vibrational loosening of threaded fasteners can be complicated. To assist the Engineer in overcoming the problems associated with the use of threaded fasteners and bolted joints, Bolt Science has developed a number of computer programs. These programs are designed to be easy to use so that an engineer without detailed knowledge in this field can solve problems related to this subject. 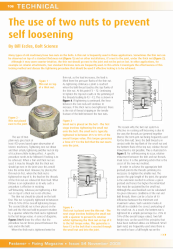 More details on this topic are available on our online training course on Bolting Technology. 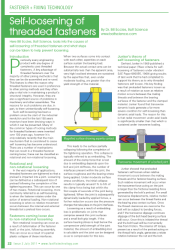 Published in the Fastener and Fixing magazine in July 2011, this article looks into the causes of self-loosening of threaded fasteners and what steps can be taken to prevent loosening. A key advantage of threaded fasteners over the majority of other joining methods is that they can be dis-assembled and re-used. This feature is often the reason why threaded fasteners are used in preference to other joining methods and they often play a vital role in maintaining a product's structural integrity. However, they are also a significant source of problems in machinery and other assemblies. The reasons for such problems are due, in part, to them unintentionally self-loosening. Such self-loosening has been a problem since the start of the industrial revolution and for the last 150 years inventors have been devising ways in which it can be prevented. Many of the common types of locking methods for threaded fasteners were invented over 100 years ago, however it is only relatively recently that the main mechanism that is considered to cause self loosening has become understood. 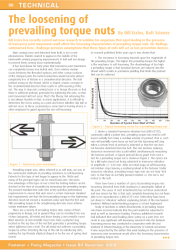 Published in the November 2009 issue of Fastener and Fixing magazine, this article looks into the causes of why prevailing torque type nuts can sometimes experience complete self-loosening. The work is based upon some original work on the subject. Prevailing torque nuts, often referred to as stiff nuts, are one of the commonest methods of providing resistance to self-loosening. Patents for this type of nut began to appear in the 1860's and many of the principal types can be traced back over 100 years. 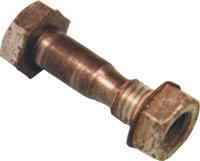 One advantage of this type of nut is that the locking feature can be checked at the time of assembly by measuring the prevailing torque. The present standard test code (ISO 2230) specifies performance requirements to ensure that nuts meet a certain minimum standard. Key requirements are that the first prevailing torque in the tightening direction must not exceed a maximum value and that the first and fifth prevailing torque in the untightening direction must achieve certain minimum values. There have been a number of cases of prevailing torque nuts becoming detached from bolts leading to a catastrophic failure of the joint. The cause of such detachments has not been understood and one reason for this is that such complete loosening has not been able to be reproduced in a standard Junker test. The article reports on how a Junker vibration machine was adapeted so that axial loading as well as transverse joint movement could be induced into a joint. The experiments conducted using the modified Junkers machine have demonstrated that the combination of axial and transverse load have a profound effect on the loosening of prevailing torque nuts. Published in the November 2008 issue of Fastener and Fixing magazine, this article looks at the use of two nuts to prevent self-loosening. Many types of old machinery have two nuts on the bolts. A thin nut is frequently used in these applications. Sometimes the thin nut can be observed on top of a standard thickness nut and on other installations, it’s next to the joint, under the thick nut. Although it may seem counter-intuitive, the thin nut should go next to the joint and not be put on last. In other applications, for example on column attachments, two standard thickness nuts are frequently used. A series of tests were conducted to investigate the effectiveness of the two-nut method in terms of resistance to self-loosening. A Junker transverse vibration test machine was used with M10 nuts and bolts. The results are illustrated in figure 6. 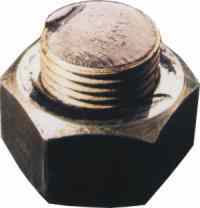 With the small nut on top, both nuts can be observed to rotate together and can subsequently come completely loose. The results are slightly better than is normally observed with a single plain nut. With the small nut next to the joint, some relaxation occurs but not a significant amount of self-loosening . The performance of the two-nut method, when properly applied, provides a superior locking capability when compared to many so-called lock nuts. The proper application of the two-nut method is time intensive and requires a degree of skill and is hence unlikely to make a major comeback on new machinery any time soon.